Published Dec 14, 2017 by Addison-Wesley Professional. Part of the LiveLessons series. More than 9 hours of video instruction to help you learn everything you need to know to deploy Linux in Microsoft Azure cloud. 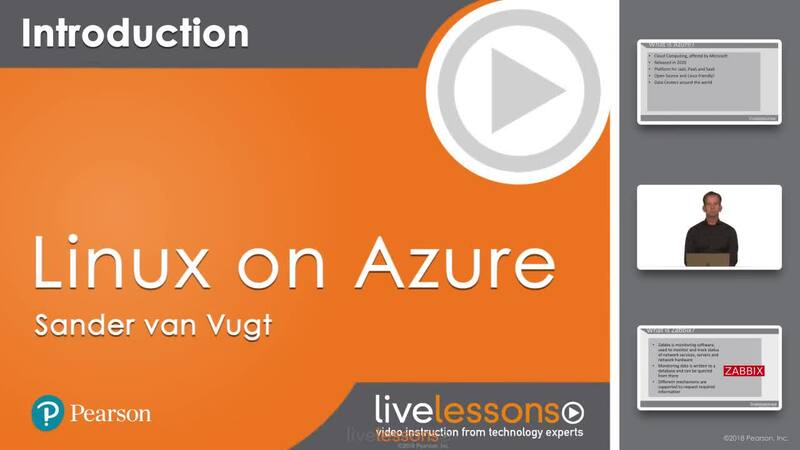 Linux on Azure LiveLessons: Deploying and Managing Linux on Azure is a unique video product that teaches you everything you need to know to get up and running with Linux if you are a Microsoft Professional who needs to deploy, manage, and monitor Linux in an Azure environment. This comprehensive video course starts with the essentials, and then quickly moves forward from there, focusing on tasks that are specific for managing Linux workloads in an Azure environment. Content includes managing containers, monitoring Linux, working with configuration management tools, and working with Azure-specific services for managing Linux. This is a must-see course for anyone who needs to learn how to administer Linux on Azure. Working experience as an IT professional. Lesson 1, Linux and Azure Fundamentals, introduces what is required to get started with Linux on Azure and the Linux operating system. Create an Azure account and interact with Azure, using the different interfaces. Lesson 2, Advanced Linux Administration, demonstrates some of the more advanced Linux administration tasks. Learn how common tasks might have to be performed in a different way while managing Linux on Azure. Lesson 3, Using Containers, is about managing containers in an Azure environment with an introduction to containers and its components. Learn what Docker is and how to install it, about storage and networking in a Docker environment, and how Docker can be integrated in an Azure environment. Lesson 4, Deploying Linux in Azure Cloud, shows options for managing Linux in Azure cloud, focusing on the different components that exist in an Azure environment for managing Linux. Work with VM images, Azure VM agent, and Azure VM extensions. Lesson 5, Configuration Management Solutions, demonstrates configuration management tools in an Azure environment. Learn about DevOps, infrastructure as a code, and how these can be used in an Azure cloud environment. Lesson 6, Puppet, shows how Puppet can be used as a configuration management tool. Learn about Puppet architecture and components, how to install Puppet and manage configurations using Puppet, and how it can be used in an Azure environment. Lesson 7, Ansible, demonstrates how Ansible can be used as a configuration management tool. Learn how to install Ansible, manage configurations using Ansible, and how it can be used in an Azure environment. Lesson 8, Chef, introduces how Chef can be used as a configuration management tool. Learn how to install Chef, manage configurations using Chef, and how it can be used in an Azure environment. Lesson 9, Salt, shows how Salt can be used as a configuration management tool. Install Salt and manage configurations using Salt and how it can be used in an Azure environment. Lesson 10, Linux in Azure Troubleshooting, is about troubleshooting Linux in an Azure environment and focuses on some of the common strategies to troubleshoot Linux when used in Azure. Work with some of the tools that are provided for this purpose by Azure and get to know some of the most common Linux troubleshooting tools that are available. Lesson 11, Nagios, introduces the Nagios monitoring system. Learn which components are involved when working with Nagios, how to set it up for monitoring, and how to use it to actually monitor nodes using Nagios. Lesson 12, Introduction to Zabbix, shows how Zabbix is used to monitor devices in your environment. This lesson explains its components, how to install it, and how you can use it to monitor assets in the Azure cloud.